Recently we celebrated the 60th anniversary of its arrival to Málaga, and our volunteers spent months restoring for the occasion. We even recreated the original picture of the first Finnish passenger disembarking. Inside it you'll be able to see the inner skeleton of the aircraft, and how the electric cables, hydraulic tubes, and mechanical polleys are distributed along the floor to control its flying systems. This multipurpose marvel went into production 80 years ago, and around 400 of them are still flying all over the world. It's believed to be the only aircraft in history to be able to achieve a century of flight. And for good reason: it was quick, cheap, reliable, easy to repair, took-off in short distances, flew further, and was the first profitable passenger aircraft. Throughout its life it has been used for military purposes, civil transport, cargo operations, rescue missions, and smuggling; on tarmac, dirt runways, and even on water. Today it shines in our museum in Iberia livery, with a recently refurbished interior, where you'll be able to see the hooks on its fuselage that allowed it to be configured at its owner's liking. In 2002 -after 52,000 hours flying since 1974- it arrived at our museum to finally rest, where it displays its similarities with most modern aircraft. It was so popular in fact, that 2,400 DC9s were made, making it the most popular jet-powered aircraft behind the 7,000 units of the Airbus 320 family, and the 9,000 Boeing 737s. By itself it weighs 26 tonnes, and it can take-off with another 24 tonnes of fuel, passengers and luggage. It can fly at 560 miles per hour, to any point within a 2,000 mile radius (Málaga to Stockholm), consuming up to 3,000 gallons of fuel. Come inside and explore the flight attendant's galleys, the first-class seats, and sit at the flight deck; remember that it's still undergoing constant restoration, but we welcome you to carefully explore its delicate aircraft controls. Nowadays, when commercial aviation is cheap and common, it's a luxury to have a private aircraft. So imagine having it in 1937! It was custom furbished with leather interiors, wide comfortable seats, and all the luxuries its owners desired. Its control surfaces are covered in fabric instead of metal sheets: that's how aircraft were built before, as it was cheap and lightweight. When you visit it, note its curious double-tail, that by being placed behind each propeller, gives the pilot greater lateral control. Recently we've given it a new coat of paint, and its interior is rapidly being cleaned, polished, and restored to bring it back to its former glory. Helicopters are really something else... they can hover in mid-air! That adds an extra layer of complexity and concentration for pilots; its complex blade rotation system allows it to move in any direction its pilot wants... by the way, did you know that on helicopters, captains sit on the right, the other way round than in airplanes? Look at its simplicity: a basic and open structure to save weight, an engine, and a "bubble" cockpit to see in every direction. Done. Its main rotor keeps it in the air and moves it in every direction, whilst the back rotor keeps it from spinning like a spinning top. It stopped flying years ago, abandoned in a field in Córdoba, awaiting our rescue and restoration as a traffic helicopter. But its story goes way beyond that: it has up to 24 sister variants, and it's an absolute prodigy: in 1946 it became the first helicopter authorised for civil use, in 1950 it was the first to fly over the Alps, and in 1952 it broke the world record for a bi-piston helicopter non-stop flight: 1,217 miles. Still unbeaten. Did you know that Málaga's first ever terminal building is still standing, and is a key part of our museum? Málaga's first airport was called El Rompedizo, and before a time when flying was something common, where security checks are strict, and when we know our destination before we get there thanks to the internet, the experience of walking into an airport terminal was very, very different. Relive it and marvel at the differences. This room is full of experiments and elements that will show you the principles of flight. You'll understand how an aircraft flies by looking inside a wing and its controls, touch open and see inside a black box, communicate by morse code, and lots more! All your questions will be answered in an exhibition dedicated to touching and learning. Here you'll be able to see the different types of engines that power aircraft, dissected to show how they work. You'll also see the instruments used onboard to measure speed, the "invisible roads" that aircraft follow when they come and go from Málaga, and how aircraft are controlled through the air. We've also set-up an antenna with a live audio and data feed from the Air Traffic Control Tower at Málaga Airport, so that you can hear and see their communications with the aircraft that are taking off and landing at that very same moment. We don't only have big aircraft that weigh several tonnes, we also have helicopters and light aircraft. This exhibition room contains flying machines ranging from a hang glider, a hot-air ballon, aircraft parts, experimental aircraft, and much more. In it you'll be able to notice that when you really boil it down, you don't need much more than a structure and an engine to fly. It's the 7 miles of wiring of a modern aircraft, reduced to the basics of flight. Imagine you're a pilot arriving at night to an unfamiliar airport, how would you know where to go? Sit back, relax, and enjoy our lookout onto the airport, by watching the air traffic take off and land before you. Málaga is the third airport in the peninsula by air traffic, with more tha 14 million passengers per year; a third of which is to and from the UK. So the flow of aircraft is almost constant, especially in peak summer seasons. Sitting at our viewing park, and armed with the mobile app FlightRadar24 (free for iOS and Android) you'll be able to see in real time the destination of each aircraft that's moving in front of you. Awaiting Restoration. Come and help us! 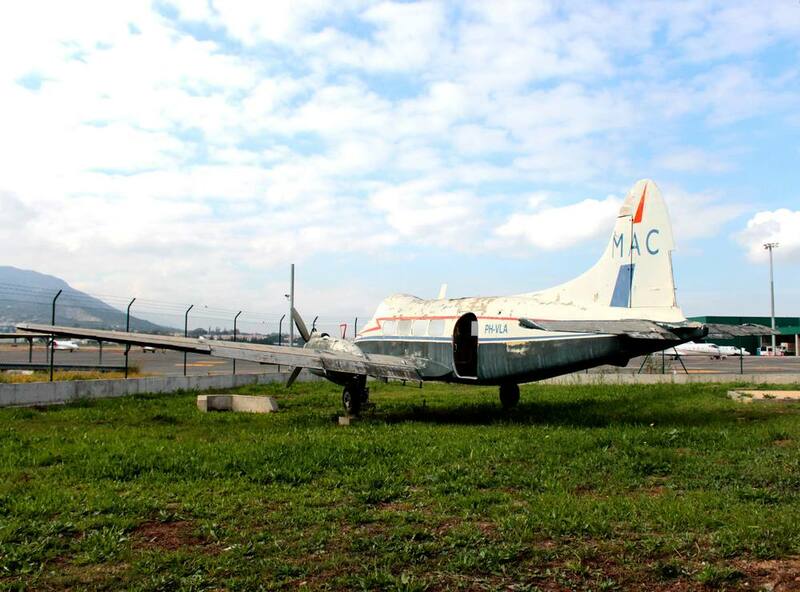 If everything you've seen is not enough, our museum has a vast collection of vehicles and airport items, such as Málaga Airport's previous radar, fire trucks, catering vehicles, follow-me cars, runway inspection systems, aircraft stair trucks, roman ruins... and the list goes on.